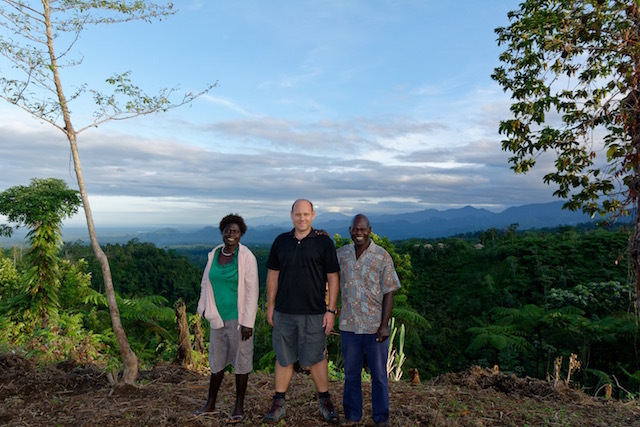 PaCSIA staff Volker Boege, Erica Rose Jeffrey and Serge Loode visited the Panguna Dialogue Project area in Central/South Bougainville for another trip in July 2015. Together with the local PDP facilitators they visited Pakia village in Ioro 2 and Sikunam-asi village in Lamane East, Bolave to conduct two more storytelling sessions with participants of the community dialogues in March 2016. The team was particularly grateful that they were joined by Elisabeth Strohscheidt from Miseror e.V. in Germany. 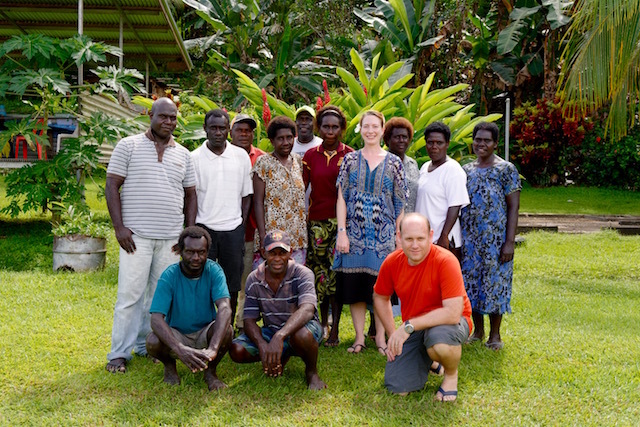 Elisabeth is responsible for peacebuilding and conflict transformation in the Asia and Pacific Department of Misereor, and the trip provided her with an opportunity to connect with the Bougainville PDP team and to meet PDP participants in Pakia village. In Pakia village the team facilitated a similar storytelling session to the ones conducted in March 2016. Pakia village is made up of communities which were displaced when the Panguna mine was originally opened. Lack of social cohesion, divisions and leadership problems had plagued the community in the past. The March community dialogue provided an opportunity for villagers to discuss a lot of these problems and to dialogue about making changes to the leadership structure. During the storytelling we were told a moving story about how this dialogue changed the lack of unity in the community: a few weeks before our visit a woman from Pakia had died. In the past such tragic events had only bothered the immediate family, but now the whole community came together, contributed food for the mourning ceremony and consoled the family. This was seen as a sign of positive change and a breakthrough for the community. At the end of our storytelling session we were also given opportunity to witness the presentation of the new clan leadership structure, and we were told that the swearing in ceremony of the new clan chiefs will happen in due course. Being welcomed by Tony Siona and his daughter in Sikunam-asi village. From Pakia the team moved on to Sikunam-asi village in Lamane East, which was the furthest point in the mountains that the PaCSIA team had travelled to so far. 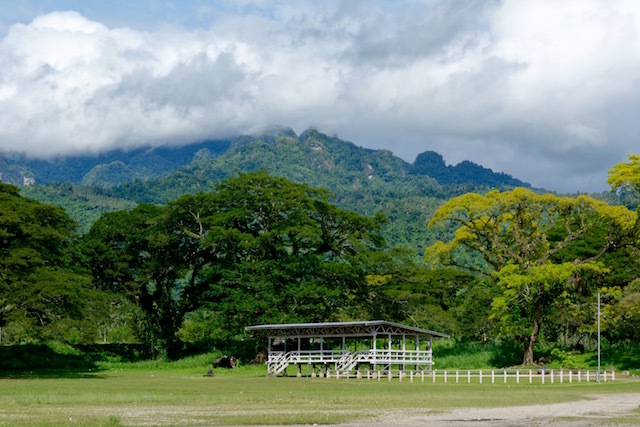 After enjoying the majestic views down from the central mountains to the West coast of Bougainville, the PaCSIA and local PDP teams were warmly welcomed by the communities of Lamane East. During the storytelling session the team heard about how the community dialogue in March provided the catalyst for the mediation and reconciliation of a sorcery case that had split the community for more than twenty-five years. During the dialogue the community decided to bring both clan elders from opposite sides of the dispute into the dialogue and to start establishing communication between them. Afterwards a senior clan and church elder embarked on a powerful journey of forgiveness and reconciliation, and the paramount chief facilitated further mediations. We visited the village one week before the end of the reconciliation process and were shown a pen with more than thirty pigs and also the traditional food prepared for the final reconciliation. All of these things clearly showed to us how proud the community of Lamane East was that they had finally resolved this long-standing issue. During our travels in Ioro and Bolave we were also able to reconnect with the Meekamui Government of Unity that we had visited in March. None other than General Moses Pipiro, Commander of the Meekamui Defence Force, kindly provided transport for the PaCSIA team, including a trip through the tailings of the Panguna mine and along the Jaba river. 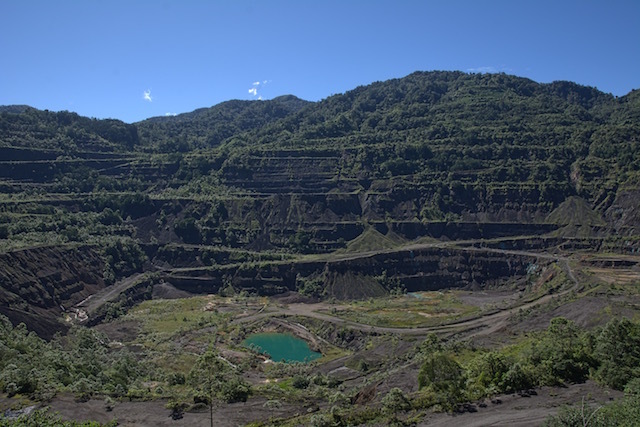 This trip reminded us again of the almost inconceivable environmental and social damage that the mine has caused to the land and the people of Central and South Bougainville. The mine tailings reminded us of a scar that had been inflicted on the otherwise green and lush tropical landscape, and that wound is visible all the way to the West coast. 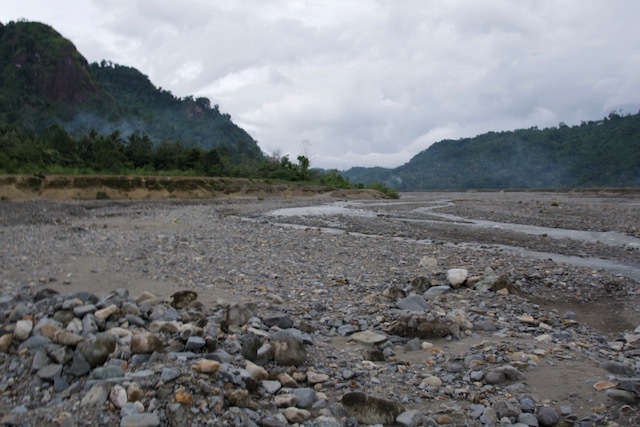 We were told about the lack of clean drinking water, gardens and the dangers of small-scale alluvial gold mining that is the only source of income for the villagers living on the banks of the Jaba river today. The trip was also a good opportunity to hear about the collaboration between ABG and Panguna Meekamui to support a peaceful and free referendum on the future political status of Bougainville in 2019. Towards the end of the trip the PaCSIA team also met with the rest of the local PDP team to debrief the different project activities that had been conducted and to plan additional activities. Fortunately we were able to schedule a number of extra activities within the budget available. 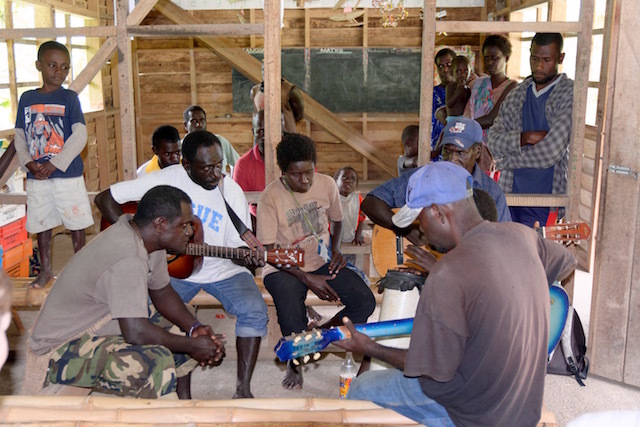 The PDP team will return to Karato, on the border between Eivo-Torau and Torokina, to conduct a storytelling session with the community there. The trip to Karato is an adventure in itself, as the team needs to travel to the West coast town of Marau and then hire a boat to go up the coast and then up a river inland back to the mountains. The PDP team also planned one additional community dialogue in Ioro 1. Follow-up reports from Ioro 1 show that the communities there struggle to some degree with the implementation of their action plan and that they require further dialogue and discussion. This dialogue will happen in the middle of August 2016. The PDP team also had another meeting with the other local peacebuilding NGO Nasioi Peacebuilding Association to share experiences. Both NGOs will work more closely together in the future. Much of the work of the PaCSIA and PDP team was supported by the Department of Referendum, Veterans Affairs and Peace, in particular by the Acting Head of Department, James Tanis, and by the director of the Department’s peace unit, Stephanie Elijah. The department has established an office in Arawa now, and the PDP team held the final steering group meeting for the project there. This meeting provided an opportunity to present the project outcomes to the steering group and to conduct a participatory evaluation process outlining the most important successes, challenges and lessons learned from the project. These will be published later on this website once the evaluation is completed. During our trip it became obvious again that the impending referendum on the future political status of Bougainville is of particular concern for the population. During the community dialogue in Karato in March, the PDP team, which also included representatives from the Meekamui, was already asked to conduct an awareness session on the referendum. The team has since connected even more closely with the Department of Referendum, Veterans Affairs and Peace and is currently building their knowledge base of referendum related questions. It is clear that there is growing uncertainty and unease within the communities of Bougainville with regards to the referendum, and so far no coordinated campaign to inform the communities and to engage them in dialogue about the referendum has taken place. The work of the PDP team has shown that a dialogical approach is much better than simple information factsheets and information sessions, and that communities need to have a voice in the preparation of referendum. 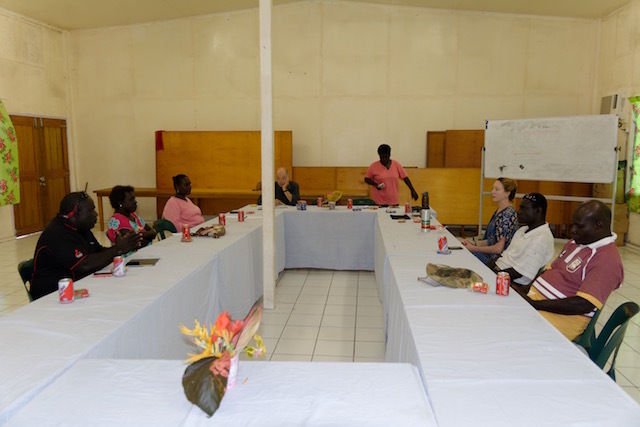 PaCSIA and the local NGO Bougainville Indigenous Dialogue (BID), which was established by the PDP facilitator team, are currently preparing a follow-on project from PDP to address this issue. In conclusion, the July trip has provided us with another opportunity to hear the voices of village people in the project area and to include their stories of change in our project. The storytelling sessions are an excellent way of follow-up and also of giving back to the communities involved in dialogue. The local PDP team has developed important relationships with the communities and also with the ABG, and they are planning a number of dialogue and peacebuilding projects through their local NGO BID. This gives us great hope that the project will leave tangible and sustainable change when it concludes at the end of 2016. The PaCSIA team has also further deepened our relationships with our local colleagues, and we have planned important further project activities as well as independent future projects. We have collected an impressive number of stories from the communities and are currently engaged in editing and translating these stories. They will be published in a small book in Tok Pisin to be printed in September of this year. In October, PaCSIA will return for a short visit to Bougainville to present this book to the communities which provided the stories and to the ABG. 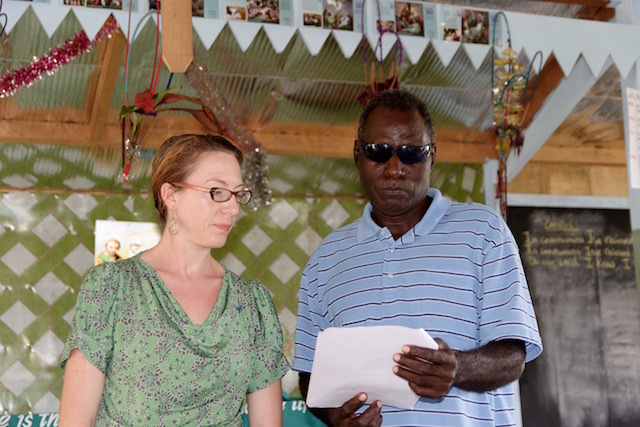 We look forward to returning to our friends in Bougainville!